The only possibility that I don’t want to even contemplate at all is to see Cameroun in the final. So, I will not even speculate on them getting there. No, I don’t want even to think about it. That’s the true meaning of rivalry! – Culled from Soccertalk, February 1st, 2017. MY WORST FEARS were confirmed last Sunday when Cameroun defeated Egypt 2-1 in the Final of the 2017 African Cup of Nations (AFCON) in Gabon to emerge the new champions of the continent. Last week in this column, I didn’t hide my bias when I wished the Indomitable Lions all the bad luck anyone could wish their sporting rival. I wanted Cameroun to be eliminated at the group stages so that they could depart the tourney in disarray like our other 2018 FIFA World Cup qualifying group rival Algeria who have sacked their coach yet again on account of a poor outing in Gabon and are lost for direction. When Cameroun somehow survived the group stage, I wished they would lose their quarter-final against Senegal; then their semi-final against Ghana; then I even wished that the Confederation of Africa Football (CAF) would simply send them home! Trust the Indomitable Lions to live up to their cognomen and rub my face in the mud. They crushed each of my wishes at every stage with some lion-heart performances and emerged victorious. If a team can beat powerhouses Senegal, Ghana and Egypt en route to winning the AFCON, that team deserves respect and admiration. In spite of myself, I hereby salute the gallantry of the Indomitable Lions in winning their fifth African title. It was fully deserved. 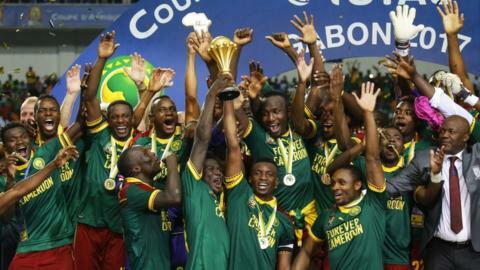 Congratulations to Cameroun. Naturally, Nigerians have been talking about the implication of Cameroun’s new status as African Champions for our own 2018 FIFA World Cup qualifying chances. All of a sudden, people are concerned about how the Super Eagles would cope with a resurgent Cameroun side when both countries meet in their crucial double-header in August. Although the Eagles currently hold a four-point lead over the Lions in the group which also has Algeria and Zambia, some pundits now posit that Cameroun have become the favourites to win the group’s sole ticket because they’re African champions. I tend to disagree. As far as I am concerned, nothing has changed about Nigeria’s chances of getting to Russia 2018. Before the start of the qualifiers, I set in this column a target of 13 points for the Eagles and stressed that netting the full nine points from their first three games was non-negotiable to reaching the 13 points mark. Whether Cameroun were African champions or not, we needed to beat them in the first leg or our double header in Uyo to complete the nine points from our first three games. That has NOT changed. And whether Cameroun were African champions or not, they were always going to give us a hell of a fight for those three points. That has NOT changed either. The three points in Uyo will be decisive for Nigeria because it will open up a seven-point gap between us and Cameroun with three rounds of games to play. Honestly, I can’t see them closing that gap in subsequent games. But we don’t need to even think too far ahead yet. Let us focus on the Uyo game, WIN IT, thereafter we can talk about what happens next. So, the big question is, can Nigeria beat Cameroun in Uyo? The answer has to be a resounding Yes! I repeat that, African champions or not, we always needed to beat Cameroun in that game to qualify for the World Cup. Nothing has changed in that respect. Perhaps the only thing that has changed slightly (and I emphasize the word “slightly”) is that Cameroun now have even more confidence to face the Eagles because they are African champions. Having spent a couple of weeks together preparing for the AFCON and another month or so at the tournament proper during which they played six competitive games, the Lions have bonded into a more solid unit with great belief in their own ability to win. That psychological edge is what I didn’t want them to achieve when I was wishing for their early elimination in Gabon. 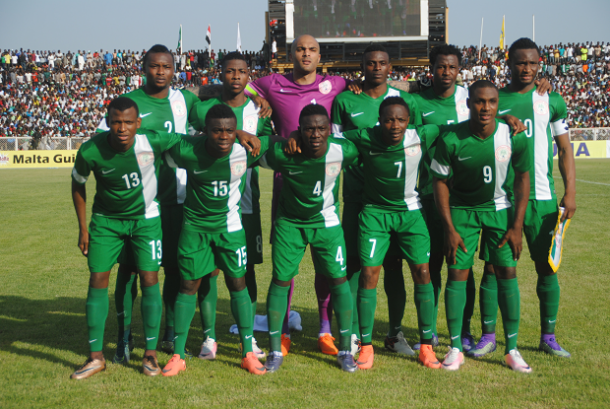 By contrast, while the Eagles did not even qualify for the AFCON, some of our key players like Kelechi Iheanacho have been relegated to the bench recently at Manchester City; captain Mikel Obi and striker Odian Ighalo have been forced out of the English Premier League to pursue their careers in the less competitive Chinese Super League while Ahmed Musa and Wilfred Ndidi are battling against relegation with Leicester City. The comparison in fortunes definitely is not in Nigeria’s favour at this time. But just like Cameroun surprised everyone at the Nations Cup, the Eagles are condemned to surprise them when they come visiting in August. What will give Nigeria victory over Cameroun are (1) the tactical acumen of Super Eagles coach Gernot Rohr; (2) the technical skills and determination of our players; (3) strict officiating by the centre referee selected for the game; (4) massive home support. Since his appointment as Eagles coach, Rohr has demonstrated an uncanny ability to decode the strength and weaknesses of our opponents and to device strategies to defeat them. He did it successfully against Zambia and Algeria and made those wins look so easy. Having watched Cameroun extensively at the AFCON, I have a strong feeling of confidence in his ability (from my personal encounter with him) that he will tame the Lions, too. As for our players, we always knew that we would be relying on the attacking skills of Victor Moses, Alex Iwobi and Iheanacho as well as the strength of Mikel Obi, and Oghenekaro Etebo to challenge the physical approach of the Camerounians. If we play to our strength and we get a referee that is strict on rough play, the Eagles will get enough opportunities to score either from open play or from several free-kicks won around the Cameroun 18-yard box. We could even grab a penalty kick if we goad them enough into committing their harsh fouls. Then, of course, our defence must be ready for some hard battering as well. Cameroun are a physical force, they have always been, but they are definitely not unbeatable. Finally, Nigerian fans must descend on Uyo to support the Eagles and not allow Camerounians from across our south-east border to take over the stadium. One major contribution to the Lions’ AFCON success which has been ignored by most analysts is the huge presence of their supporters because Gabon is just across the southern Cameroun border and it was easy for the fans to make the trip in their thousands. I suspect the Cameroun fans will be planning a similar invasion on Uyo. Nigerians must resist them in order to make the Eagles feel truly at home. Matches between Nigeria and Cameroun have always been a big battle especially when a lot is at stake. Playing at home, the Eagles remain the favourites to win the first leg in Uyo. I reckon that, in the final analysis, that first leg win will be enough to get Nigeria to Russia 2018. Cameroun have won the Nations Cup, but Nigeria is poised to beat them to the World Cup. · Oga Mumini. Up Indomitable Lions of Cameroun. Against all odds and predictions, they won the cup for the fifth time. Hurray, the Lions. – Franklin, Npf. Mumini, it was obvious that you predicted the AFCON 2017 semi-final winners with your heart rather than your head. You insinuated same in your article which was very unlike “OCTOPUS MUMINI”. Your worst fear is here, Cameroun is in the Final and could beat Egypt! For me, it does not matter which of the two finalists goes on to win the cup as both of them would end up putting the “daylight” between themselves and Nigeria with an additional win. Painful but congrats to the eventual winner. Egypt turned out to be worthy qualifiers in place of Nigeria at the AFCON 2017. – Howard Odigie, Lagos. Hajj Alao, I share your thoughts completely on AFCON. But wishes are no horses for beggers to ride. The results will put Super Eagles on their toes. – Alh. Aminu I.B., Ilorin. Oga Mumini, the Octopus of Africa. Your tips for the final of AFCON 2017 failed! What happened to your power of prediction! Please work on it for the future. – Akeem Lawal. Oga Mumini, once again you have expressed my mind on the last four teams in this AFCON 2017. This is my own take, also with a Nigerian bias. I will prefer a Burkina Faso win to prevent the other three from extending their number of title wins over Nigeria. But as I write this, Burkina Faso and Ghana are out. So I would prefer Egypt to further extend their wins rather than Cameroun. – Lanre Oredein, Benin City. * My response: Hi, Franklin and Hakeem, I didn’t make any prediction about Cameroun. As Howard and Lanre pointed out, I never hid my bias that I just didn’t want to see them in the final! However, I agree completely with Aminu that Cameroun’s eventual victory will put Super Eagles on their toes when the 2018 World Cup qualifiers resume. The story of the Indomitable Lions at the 2017 Afcon is without doubt similar to what happened to the Super Eagles at 2013 Afcon when we won against all expectation. But rather than being a morale booster, we all knew what happened as we are yet to grace another Afcon since then. While they now seem to be in the driving seat as regards the upcoming world cup qualifiers with the Super Eagles, I see the same thing happening to the Camerounians and I agree with you that the Eagles will surely nick the world cup ticket. While they will not need to qualify for the next Afcon, being the host country, the burden of being defending champions and at the same time will surely prove to be their undoing. I also want additional 'pound of flesh' from the Camerounians - I will be particularly glad if the Super Eagles can also ‘steal’ the Afcon right in their backyard just like they did to us in 2000 Afcon in Lagos!